We Recommend Electrical Panel Upgrades | Anderson Electric Corp.
How long have you lived in your house? Do you still have the same electrical panel or fuse box as you did when you moved in? You may need to have upgrades for the panel, or possibly a completely new panel installation. This is not only an issue of electrical efficiency; it can also be an issue of home safety! The electrical panel or fuse box (sometimes called a load center) is something like a train switching station for your house or other building. As electrical power enters the home, it’s the job of the electrical panel to divide the current into different circuits for distribution throughout the building. The panel also protects the electrical system with fuses or breakers for each of the circuits. If there’s a voltage overload in a circuit, the panel will either trip a breaker or burn out a fuse. In either case, it stops the flow of electricity to the circuit until the breaker is reset or a new fuse is put in. Some homes (and most commercial buildings) may have sub-panels to service individual areas with multiple circuits. Your kitchen may have one. These load centers are not meant to last forever. The amount of electricity used in homes has risen over the last two decades. In 2017, the average annual electricity consumption in a US home was 10,400 kilowatthours (kWh), an average of 867 kWh per month. This is an increase from only four years earlier, when annual electricity consumption for a house was 9,090 kWh. The rise is even steeper when you look back ten or twenty years. With more electrical devices and charging stations, homes consume more electricity than ever before. Can your current load center handle the rise in electrical use? If it’s more than a decade old, it might require upgrades to allow for it to work its best. If you have noticed more tripped circuit breakers than before, we recommend calling our team to arrange for a consultation. For older panels or ones that have suffered electrical fires in them, we’ll advise a full panel replacement. If you still have a fuse box rather than a panel with circuit breakers, you definitely need an upgrade. To deal with the rise in electrical usage, increasingly larger fuses must be put into the panel, and this creates a major safety hazard! Electrical panels are much more convenient anyway, since you don’t have to replace fuses, only reset tripped switches. This is a good idea for a panel upgrade: adding surge protection. A whole-house surge protector reroutes excess voltage (such as from a lighting strike or a surge from the power plant) down into the ground. This can prevent serious damage to appliances and sensitive equipment in your home—basic power strips aren’t enough! 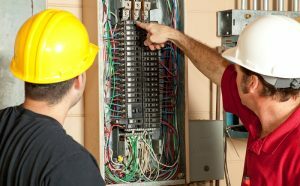 If you think you need service for an electrical panel in Clifton, NJ, please contact us. With over 25 years of experience and a trained staff of technicians, we’re expert troubleshooters and can diagnose and repair all electrical problems you may have in your home or business. Arrange for an appointment with Anderson Electric Corp.: Safety – Dependability – Service!